I can’t think of a better shoe for these rainy Spring days! Hunter rain boots are such a great investment, who wants to ruin their shoes? No one! (especially if they’re costly) This Kentucky weather can be so speratic, one minute the sun is shining, the next minute it’s raining! If I see rain in the forecast I pack my boots in my car. Before I ordered these I read so many reviews on this brand. 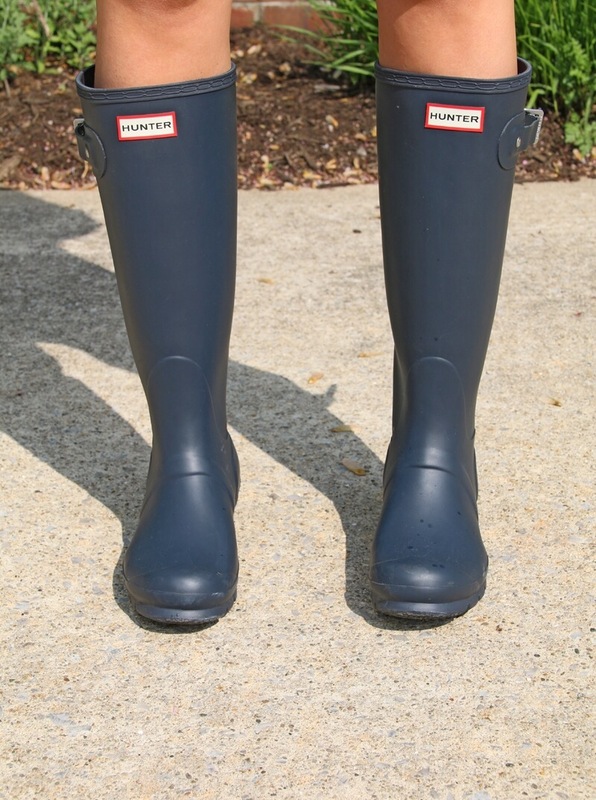 Hunter makes quite a few different types of rain boots, but I read the most positive reviews on the ‘original tall’ color: navy matte (and they seemed to fit my needs the most). So be sure to research a bit before buying, because Hunter makes different styles fitting almost everyone’s needs (which makes them feel more customized)! And did I mention ALLLLLL the colors, good luck choosing just one! 😊 Also, if you usually wear a 1/2 size go down in size. I wear my Hunter boots with dresses, skirts, jeans and shorts (so basically anything). 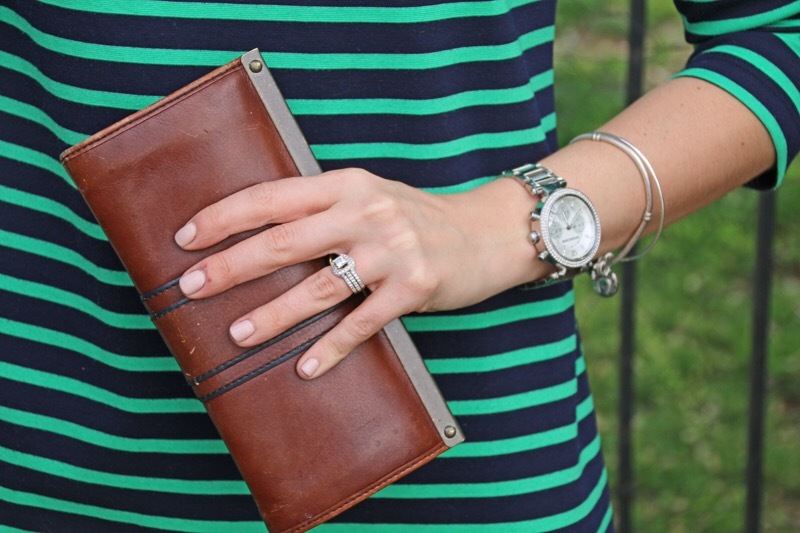 They are so simple to style and put on with whatever; I usually keep it pretty simple. If it’s raining there’s no use in trying to dress up, because you’ll probably end up soaked! 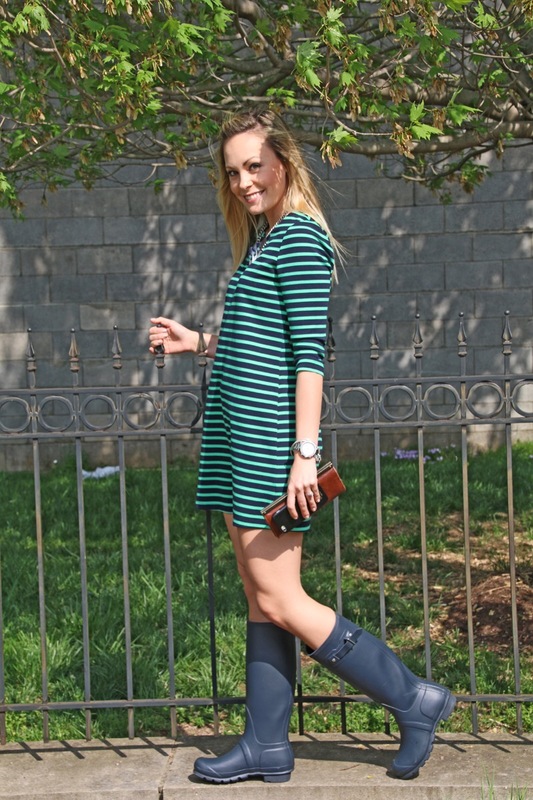 What are some of y’all’s favorite go-to rain boot styles!? Cheers to an amazing weekend! My girlfriends and I are running a 5k in the morning, wish us luck! It’s lovely to see you wearing your Wellingtons you look gorgeous, I always wear my Wellingtons when it rains I hate getting my Stockings splashed.